16" and 20" around brim. Hat is very stretchy. Shell Horizons Hat is a slouchy, beret style hat to be worn in the spring, summer, or fall. It’s a touch of lace, made in just two skeins of a cotton yarn, and is designed to be stylish, yet quick to make. There is also a matching Shell Horizons Scarf, also available for sale online. Hat measured at brim is 16” and 20”, but stretches an additional 2”, making the two sizes within the pattern fit a wide variety of heads, from child to adult. 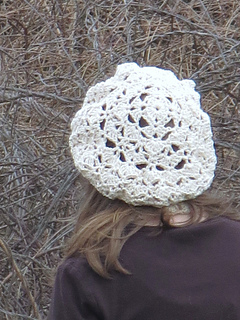 Hat uses a variety of stitches, including single, half double, and double crochet, shells and V-stitches, and is made in the round starting at the top of the hat. It is rated advanced beginner/intermediate because of the variety of stitches used. Many thanks to my testers, Vaughnde and sianbird. 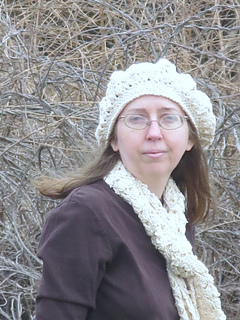 If you have any questions or comments or just want to join like-minded souls, please join my Ravelry group at http://www.ravelry.com/groups/anastacia-knits-designs. Thanks!